LibAnswers Update – New Chat Operator Interface is Here! The new LibChat Operator console will be released to all regions by the end of the day on Friday June 29th, 2018. But, keep in mind that we are not changing the current console to this new version just yet – we’re making the new chat operator console available to everyone to test it out, try things, get accustomed… and then when you are ready to switch to the new console on the system level, your LibAnswers system administrator can make the new console the default for everyone, in system settings. When you login to LibChat, you will still see the current/existing console by default. To use this new console instead, head to LibChat -> New Chat Dashboard and you can switch back and forth between the current and the new chats on different days – until you are fully comfortable making the new chat interface the only one to use for the entire site. List View of All Chats – The new chat UI utilizes a standardized list view of all ongoing chats, so it’s easy to keep track of all of your conversations without having to move and resize boxes. Expanded Chat Pane – Now you have a much more spacious area for each chat conversation you’re part of. We’ve also made a number of quality of life improvements inside the chat pane for operators, including left-orienting all of the chat conversations, adding clearer indicators of who said what, better timestamps and improved “Patron is typing” notifications, etc. Conversation history with Patrons – If you choose to do so, you can view the history of conversations (both chats and tickets) from the patron you’re chatting with. Of course we’re fully aware of the privacy concerns as well, so this tool will only return chat and ticket history from the time period inside your privacy scrub window. The privacy scrub is a standard feature of LibAnswers – it’s run on a monthly basis, and you get to choose the number of months for which you’d like to retain data prior to the scrub – contact our support team to set this up for your site. Dedicated Department Chats – We’ve added dedicated chat channels for each department you monitor, so everyone who monitors a department can be part of the same ongoing internal conversation. Use these new department chats to discuss and strategize around chat question trends, staffing coverage issues, or the latest departmental happenings – it’s up to you! New Internal Note Field for a Chat – A new operator-side internal note feature displays at the end of each chat session. It’s a handy way to communicate high level information about the chat with admins or other staff members who may be reviewing the chat transcript after the fact. Any internal note you add will be appended to the chat transcript itself, keeping all the information in one tidy place. Answer Tickets from the LibChat Interface – As with the existing chat interface, you can respond to SMS, Twitter and Facebook messages right from the new chat dashboard, so it’s super easy to keep on top of all instantaneous methods of communication. In the future we’ll also be working on a way to answer all tickets from this pane, making LibChat a one stop shop for all communication! To give the new chat interface a spin head to the orange command bar and choose LibChat > New Chat Dashboard. The new chat dashboard is fully linked to your existing department affiliations, so it’s easy to try out answering patron questions right from the get go. Just be aware, internal department chats between users on the old and new chat dashboard won’t work (though you can still talk with individual librarians between the old and new chat). Once you’re ready to fully make the switch for your whole site, admins can head to Admin > LibChat Setup > Settings to switch everyone over to the new dashboard. SMS Macros – We’ve added the option to create macros that are specific for SMS messages – these macros don’t contain any HTML, so they’re perfect for sending to SMS users! To create an SMS macro, head to Admin > Macros > Create SMS Macro. Edit FAQ Info from the Knowledge Base Explorer – We’re adding the ability to edit high-level information about an FAQ – including its group assignment, assigned topics, keywords, and status – right from the KBE, instead of having to navigate to each individual FAQ. Head to the FAQ Knowledge Base and click the edit icon to give it a spin. FAQ Topic Multi-Select – We’re making it loads easier to apply multiple topics to an FAQ – now, instead of selecting each topic individually from a drop down list, we’ve updated these menus to support multiple selections and easy keyboard navigation. To see it in action, head to the edit FAQ page. We know we have the greatest clients in the world. You and your teams work hard to provide excellent service to your patrons and — when you have a breather, you use it to make things more efficient internally, too. That’s why we want to take some of our time to acknowledge the incredible work being done. You’re winning awards and when you achieve goals using Springshare tools, we couldn’t be happier. The American Cheese Society has probably heard that joke dozens of times before. But, it’s likely they don’t mind because they’re hearing all kinds of praise, too, these days. This year, PR News announced the winners of the 2018 CSR & Nonprofit Awards. Top campaigns — that make a positive, lasting impact on the world — were honored at a lunch in Washington, D.C. The American Cheese Society, a Springshare client since 2016, was named the 2018 Nonprofit Winner for Web Site for The Safe Cheesemaking Hub. We’re excited for them and are so proud that this site is built with LibGuides CMS. While there are many LibGuides CMS features that folks are interested in, using it to power a website is one of the most popular reasons people love it. It’s super flexible, truly customizable and easy to use. The Safe Cheesemaking Hub provides food safety resources for cheesemakers. It highlights useful websites like the Cheese Science Toolkit. It links to a LibGuide built by the American Cheese Society called Best Practices Guide for Cheesemakers. The hub points to food safety publications, includes factsheets, and more. The PR News winners included brands like Disney, Honeywell, and Aflac to name a few. We are elated that The American Cheese Society and their hardworking team has been recognized for their efforts! The Employee of the Year is…The Library! Yes. You heard that correctly. The Virginia Department of Transportation (VDOT) Research Library was recently recognized as Employee of the Year! How did the library, collectively, earn this honor? The accolade was for the implementation of a new, public-facing Library Website. Linda Cullop, the IT Technology Specialist, also shared the honor with the staff of the library. The site is powered by LibGuides CMS. VDOT’s Research Library has been a Springshare client since 2015 and was featured in a Client Story where Ken Winters shared his experiences using Springy Tools, including the LibAnswers Platform and LibWizard Lite. We’re thrilled that the staffers are getting website kudos for Excellence in Productivity and Customer Service. However, what you won’t see on the surface is the fact that they have worked just as hard on creating a private internal site that they refer to as the Library Staff Lounge. They use this lounge for professional development. More and more clients are looking at using the LibGuides CMS system for a staff intranet. The Groups feature combined with the Access Rules exclusive to this advanced version of LibGuides — are quintessential for creating an intranet. They even use the system’s blogging functionality for their Quarterly Report. The VDOT Research Library is working to serve its patrons both public and internal — and the powers that be are noticing! We see you, too, VDOT Research Librarians… and we’re so proud. Tennessee is on the SCORE Board! The State Collaborative on Reforming Education, known as SCORE, just selected a group of 38 for its 2018-19 Tennessee Educator Fellowship. 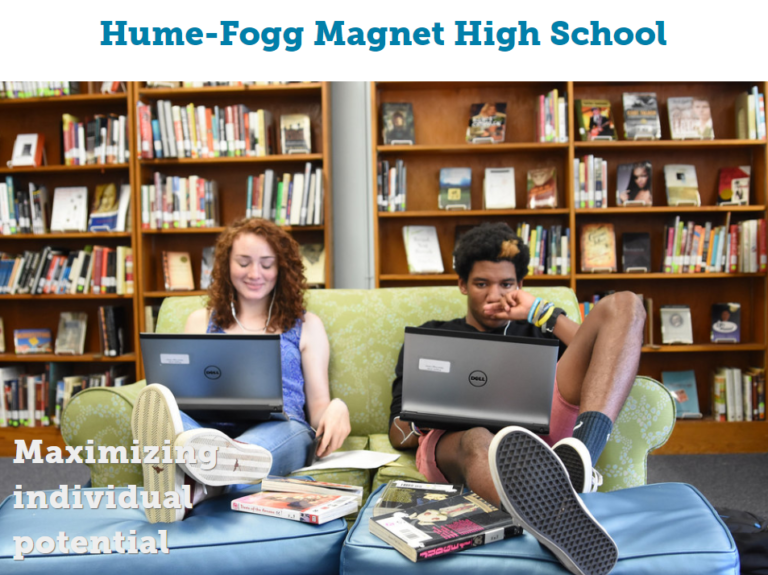 Springshare is so proud that Amanda Smithfield, the Librarian at Hume-Fogg Magnet High School, has been named one of the Fellows and will participate in a yearlong professional development program. Amanda has been an educator for 23 years and has been a LibGuides user since 2011. She has built an impressive number of LibGuides ranging in topic from Art with 1136 views, to AP Government boasting 819 views, to Honors Biology, which has a whopping 1906 views! Amanda loves LibGuides and is thrilled that her students can access her guides 24/7. The Tennessee Educator Fellowship celebrates the talented, passionate advocates who work tirelessly to support student success and advance the field of education. Springshare congratulates Amanda and wishes her well as she embarks upon a year of working with a diverse group of dedicated school counselors, teachers, and librarians who’ll all be learning about education policy. 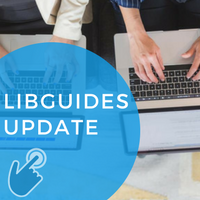 Mid-year LibGuides Updates are Coming Your Way! reCAPTCHA on the password reset page – Forgot your password? No problem! 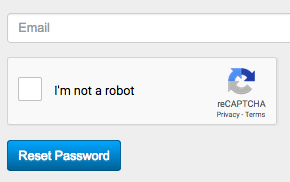 Now when you need to reset your password, you’ll see that familiar “I am not a robot” checkbox that you’ve probably seen in lots of other places. This added layer of protection will prevent bots from successfully submitting this request. Have you ever pasted some code into a widget asset and gotten some really unexpected results? Sometimes code copied from another site contains incomplete HTML or is missing a closing tag or two. Never fear! We’ve implemented a check when saving new widget code. If you happen to write or paste HTML code that is missing a tag or that contains tags that will mess up your guide, we’ll warn you! We updated our back-end processing for importing information from Serials Solutions. We fixed a bug that prevented database description popovers from closing after a database opened in a new tab. We fixed a bug preventing the yearly guide stats from updating on the system homepage. We fixed an error preventing people from subscribing to a blog from a secondary site domain. All new LibCal, LibGuides, and LibAnswers app installations will be set to require HTTPS. We fixed an issue with the character counter for guide custom JS/CSS code. When you publish a previously-saved draft blog post, the page now refreshes properly. We fixed an issue that caused the assets data table to break if you assigned dozens of subjects to an asset. We removed outdated export buttons from the Content > Guides page. Use the Export All features to export this information. The LibStaffer 2.8 release is on its way, and will be released to all regions by the end of the day Thursday, June 28, 2018. There’s a lot of great stuff in this release: a super exciting new clock in / out functionality, color coding for schedules in multi schedule view and new email management settings to help you control which automated emails you receive. Let’s get to it! Clock In/Out Enabled per Schedule – Each schedule in the system will have its own time clock settings. To enable it, admins can head to Admin > Individual Schedule Settings > Time Clock. Clock In/Out Only when Scheduled – Folks can only clock in within an hour of when they’re scheduled to work. Clock In/Out Limited by IP Address – Limit staff to clocking in/out only on workstations within a specific IP range. To add an approved IP range for clocking in, admins can head to Admin > Individual Schedule Settings > Time Clock. (Future Feature) Clock In/Out on Mobile, limited by Geolocation – Later this summer we’ll introduce the ability to limit clocking in and out for shifts only if they’re within X feet of their work location using mobile phone. Schedule Location – Related to the above feature, we’re introducing a new “Location” object for schedules. This new setting gives you the ability to input the address where work should occur, and automatically determines the longitude and latitude coordinates related to that address. If you need to refine the location where work happens further (to get closer to ex the location of your Front Desk within the building), these coordinates can also be customized to target exactly the location you want to specify. To add a location for your schedules, head to Admin > Schedule Settings > Location. Admin Clock In/Out Overrides – Sometimes it happens – staff can sometimes forget to clock in or out for a shift. Admin dashboard shows “Currently Clocked In Users” box and admins have the ability to clock users in or out, right from the dashboard. Clock In/Out Notes – A new notes field that displays to the staffer when they clock in/out for a shift, giving them an opportunity to share any relevant check in/out notes with admins. Clock In/Out Reports – No clock in/out tool would be complete without full featured reports! The Clock In/Out reports show all info for each clock in/out e.g. dates, times, and shift duration. Admins can also view clock in/out notes. If adjustments to clock in/out times need to be made, admins can make those right from the reports page. Customize Email Notifications – The ability to opt out of certain email notifications that LibStaffer sends. For example, if you’d rather not receive emails when people Give Up shifts or request Time Off, you can now opt out of receiving these emails. To customize the notifications you receive, head to Manage Account > Email Alerts. Color Code Schedules in Multi-Schedule View – Assign a color to each schedule in your site, so that when you’re viewing multiple schedules in Multi-Schedule view, each schedule will display using the color you’ve assigned. To assign a color to a schedule, head to Admin > Schedule Settings > Calendar Settings > Color in Multi-Schedule View. Dashboard Updates – We’ve polished the look of the Dashboard page to bring you a cleaner, more streamlined look when you first log in to LibStaffer. Head to the Dashboard to check out these improvements! Forget the mumbo jumbo… we’re all about the mumbo gumbo in New Orleans — June 21-26 where ALA Annual 2018 brings librarians to The Big Easy. Before you get too wrapped up in the excitement, make a note that Springshare will be in Booth 3920. Come by, say hello, and check out our brilliant Flash Presentations given by us and… “bayou.” We’re thrilled about our guest speakers and can’t wait for you to see how they use our tools in their libraries. If coming to NOLA is not in the tarot cards for you this year, you can still catch the Flashes on Facebook Live as we will be recording the guest sessions. Make your way to the Springshare Facebook Page at the scheduled local New Orleans time and it will be like you were there. In fact, you can even ask questions in the comments section. We’ll be sure to get those over to the speaker so we can get you your answers. Back by popular demand, we have teamed up with the BiblioCommons folks to show the special integration between LibCal spaces booking and BiblioEvents. Curious? Come to Booth 3920 and see exactly how it works. We know you’ll be out catching beads in the French Quarter! Make sure to catch these inspiring presentations, too. Springshare clients will take the stage and share the innovative ways they’ve been using our solutions in their institutions. It’s always amazing to see how a different use can come into the world and how imagination and fearless librarians can push tools beyond even our original vision. Don’t forget, we will be recording all the guest presentations live on our Facebook page. The Troy University Librarians use LibGuides to help train library student workers, provide access to Government Documents, and help professors for specific classes by using both bibliographic and subject-specific styles. This presentation will showcase the various ways Troy University has utilized LibGuides as well as ways we intend to use them in the future. As part of our campus active learning initiative, the library now checks out equipment for audiovisual projects using the LibCal Equipment Manager. In order to provide training and support for both students and faculty, the Emerging Technologies Librarian also creates tutorials, technology overviews, and customized project instructions using LibGuides. By combining the two platforms, students are supported from project assignment to completion, and faculty can collaborate with librarians to develop projects, assessment tools, and experiment with flipped classroom and other learning technologies. This LibGuide presentation covers how to incorporate a virtual environment into your LibGuide. When used effectively within the LibGuide homepage, Emaze presentations can provide a visually engaging user experience, one that may enhance and reiterate the content within the LibGuide. Learn how Lisa remixed their LibGuide with LibWizard (and other cool embedded tools) to coordinate, teach, and assess library instruction for first-year writing students. Learn how the University of Baltimore Langsdale Library student staff from Access Services, Achievement and Learning Center, Integrated Digital Services, and Acquisition & Discovery Services departments collaborated to develop a mobile-friendly finding aid in basic LibGuides for use at a single service point. This presentation will share the development of three Adelphi University LibGuides on trending topics and how they impacted outreach and instruction. Best practices for developing similar guides will also be discussed. This presentation will describe the use of the Springshare product LibGuides CMS to create a hospital library website. In the spring of 2017 our Web Services department began the final stages of migrating institutional webpages, including the library website, to a new web content management system (CMS). When the new web CMS template failed to meet the needs of the library, we were given special permission by Web Services to use our existing LibGuides CMS instance to create the library website. As the new LIS Subject Specialist at Rice University’s Fondren Library, I decided to create my first ever LibGuide. To be honest, it’s actually something that’s been on my librarian bucket list. My goal in designing this LibGuide was to promote Fondren’s collection of LIS books and journals as well as to provide resources that are freely available and of interest to LIS students and practitioners in general. Pardon the pun, but we just couldn’t keep ourselves in check. We were too busy checking out these awesome uses of LibCal’s Equipment booking module, and we just couldn’t reserve our excitement. But in all seriousness, we get lots of folks asking us for examples of libraries using our tools. So, we’d like to highlight a few different types of libraries, from all over the world, using the LibCal Equipment Booking module. 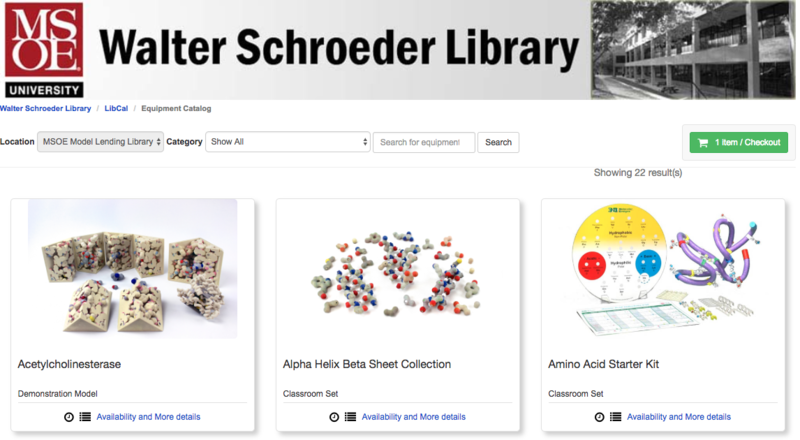 The Walter Schroeder Library at the Milwaukee School of Engineering was an early adopter of the LibCal Equipment Booking Module, and their use-case is absolutely fascinating. They use it to manage online reservations of their molecular models, which they ship all over the country to their students. Their loan time is three weeks, which includes two weeks of expected shipping time. They’re able to manage these reservations and the additional padding all from within the Equipment Module. Additionally, their custom reservation form includes all the important mailing information, so the library can cut down on the back-and-forth and get right to the business of shipping out the models. Want to hear more about how the Walter Schroeder Library manages these long-distance reservations? Check out their ALA-MW 2017 flash presentation lead by librarian Denise Gergetz. You can also download her presentation slides. 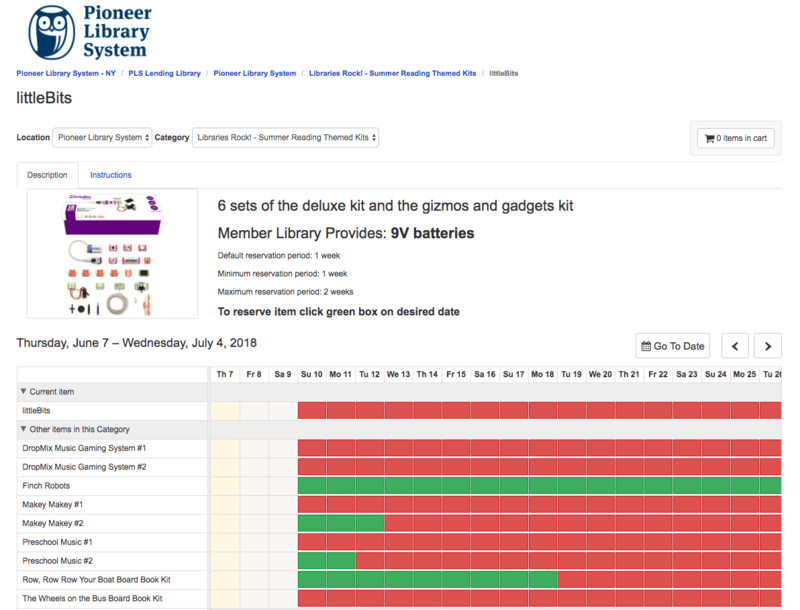 Just looking at the super-cool stuff the Pioneer Library System is circulating with their LibCal Equipment Module makes me want to be a patron of this library! Not only can their patrons reserve maker space items like littleBits and access to their 3D printer, but they also have button makers, jewelry making tools, and costumes! With the ability to manage different reservation timeframes for each type of item and with big, colorful images to advertise the cool stuff they have at the library, we can see why the Pioneer Public Library System’s LibCal Equipment Booking Module is busy busy busy! The Pioneer Public Library has amazing usage of their Equipment. Look at all that red! When you think of ‘Equipment’ it’s easy to get hung up on physical stuff. But, that’s not always the case! 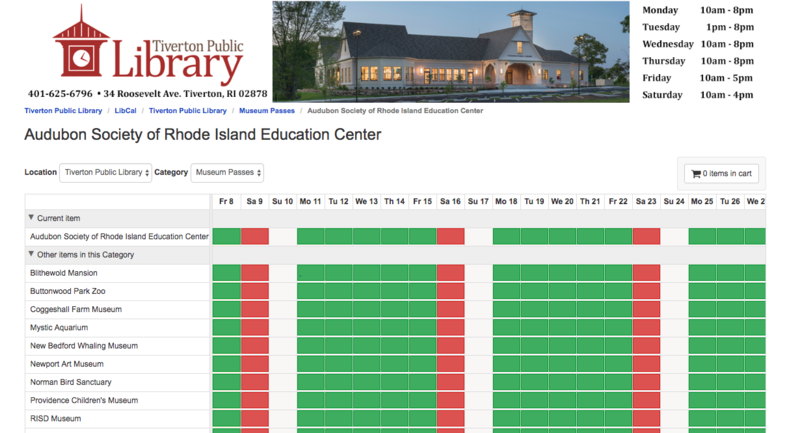 The Audubon Society of Rhode Island’s Education Center has a ton of museum and zoo passes that are available to their patrons. They’re using the LibCal Equipment Booking Module to manage circulation of those items. Using Equipment Bookings to Manage Circulation of Library & Museum Passes! Although Scotch College School for Boys in Australia might be using LibCal Equipment Bookings to circulate more “traditional” library items, their customizations are anything but traditional. Using LibCal’s built-in code libraries and flexible customization features, the librarians at Scotch College are able to put a little pizazz on their visual equipment catalog. Simply hover over any of the pieces of equipment; notice how the item just jumps off the page? Its that little bit extra that makes their LibCal Equipment Booking catalog pop, literally. 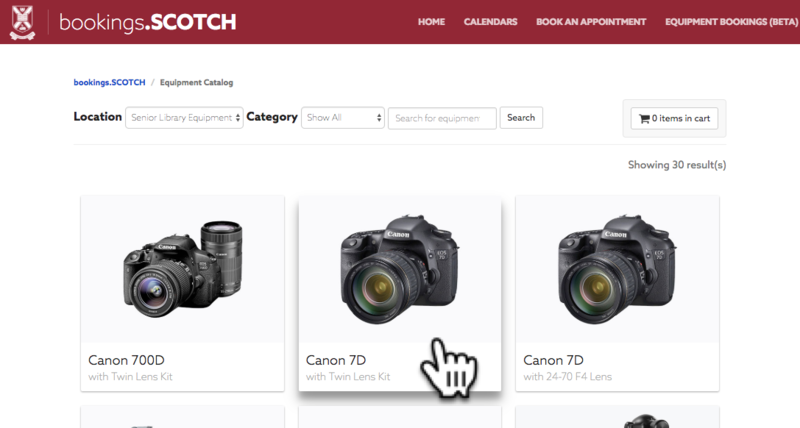 Gorgeous hover effect adds a pop of pizazz to Scotch College’s Equipment Catalog. If you’d like to learn more about LibCal’s Equipment Booking Module or more examples of Libraries using it, please contact us. We’ve sent out all of our GDPR notices, so now it’s time to get into a different security conversation: HTTPS and browsers! Good security as a baseline is important, and with browsers also working toward that goal, it’s time to really dive into the HTTPS action with all of your sites. Remember last year when we posted about Chrome’s changes to mark any webpages that load over HTTP and contain form fields as “not secure”? Well, in case you haven’t heard, they’re continuing to raise their security game, working toward their end goal of all HTTP webpages having a “Not Secure” indicator vs. HTTPS pages having a green lock/Secure indicator, since security ought to be the standard. Springshare agrees with this impending move, which is why we have made it very easy for our customers to make this transition. In addition, the end of life deadline for TLS 1.0 (an older security protocol) is rapidly approaching (June 30, 2018), so we are removing that protocol from our code. This will not affect most of you, as it is a protocol mainly left in place to accommodate older browsers. (…and none of you are using older browsers, right? 😉 ) What this amounts to is that we are no longer supporting outdated browsers, such as IE10 (which Microsoft stopped supporting in October 2016). Of course, the big question in all of this is: what does it all mean for you? Well, in terms of your Springshare apps, we’ve got you covered! While there are still a few things for you to think about / do / keep in mind, we’ve been working hard over here at Springy HQ to make this transition to an HTTPS world as easy as possible for all of your Springshare apps. First, let’s talk security certificates. If your site uses a Springshare domain (e.g., mylibrary.libguides.com), you’re all set! You can use the security certificate we have in place for each of our main product domains (e.g., libanswers.com, libcal.com, etc.). If you’re using a custom domain with your LibGuides, LibAnswers, or LibCal sites (e.g., ask.yourinstitution.org), those domains need their own security certificate. In January, we announced that we’re using Let’s Encrypt as a method to obtain free security certificates for all LibGuides, LibAnswers, and LibCal sites with custom domains. This required some work on your side…really, on your IT colleagues’ side…before the certs were requested. Well, we just made things even easier: we’ve updated our infrastructure to automatically request Let’s Encrypt certificates for all custom domains without you or your IT colleagues having to lift a finger! Woo hoo! This means that everyone can load their Springshare apps over HTTPS no matter which app or domain! Step 1: Obtain a cert. CHECK! Since you can load your site over HTTPS (without having to lift a finger), the next step is to require loading of your sites over HTTPS. After all, if you don’t require it, your users could end up loading your page over an HTTP connection (from an explicitly written HTTP-based link on the page, for example). But if your site is working well in HTTPS mode, you can force it to always load via HTTPS with the click of a button, so that users will always load your pages securely. Once that’s done, enable the “Force HTTPS” setting in your systems. It is important to note that simply changing HTTP to HTTPS does not guarantee that the embedded item will load over HTTPS. The website where you got the code for that embedded item must support HTTPS in order for it to load over HTTPS. Once again, for Springshare related things, we’ve got you covered! Our images (uploaded via the Image Manager), widgets, and APIs are already set to roll for HTTPS action (meaning they’ll all load via HTTPS). So how do you find these HTTP embedded things in your site, so you can update them? You have a few options! Widget items: use the filtering options in the Content > Assets area. Once on that page, limit Type to Widgets, enter http: in the Description / Metadata field, and click Filter. Click the edit icon for each item and review as noted above. In LibAnswers you can use the “Search” part of the Admin > Assets > Search & Replace Links tool to find all instances of http: in your FAQ answers (yes, even though it says Search & Replace Links 😉 ). Be sure to check off the “Perform a search only” checkbox when using this tool. The first section will list any Public FAQ Links that contain http: – which may be just fine (though if there is an https equivalent, then it’s a good thing to update). The second section lists Public FAQ content that contains http:. Be sure to check this second area, as it’s likely where you may have embedded something. Also remember to check your Embedded Media / Widgets in your Public FAQs! Load your page over HTTPS and use your Browser’s developer tools (usually something along the lines of: right click on the page > select Inspect > select the Console tab) to see what it marks as “mixed content” on each page. This may take a while, considering the number of pages you may have on your site, but it’s an option. Another option is to use one of the myriad of tools that have popped up to help with this very thing! Do a web search on “mixed content check” (or similar keywords) and you’ll find options like “Why No Padlock?”, etc. (We’re not endorsing any particular thing; that site is simply noted as an example.) Continuing with using that site as an example, it works like this: you enter your https link into the tool and it scans that page (and any page that it links out to), notes any mixed content, and reports back to you with a list. It’s a great way to find all mixed content at once and/or as a check before forcing HTTPs for your site. Once you’re done updating your sites and have no mixed content, you’re ready to require that your Springy app pages load over HTTPS! (Note: This does not affect links out to other webpages, only pages within your Springshare apps.) This helps in a couple of situations: someone types the URL of your site, but doesn’t explicitly type HTTPS at the beginning OR there’s a link on one of your site’s pages that goes to another page in the site and it hasn’t been updated to use HTTPS; in either case, the user will be automatically redirected to HTTPS, ensuring their connection remains secure. How do you require HTTPS in Springshare apps? Go to LibApps > Admin > Domains and Certificates. Click the padlock icon in the Actions column. Go to the “Force HTTPS” tab and choose “Required”. Go to LibWizard > Admin > System Settings > Misc Settings. Check off the “Load Site in HTTPS?” option and click Save. LibStaffer, LibInsight, and LibCRM operate solely via HTTPS; there is nothing to change. If you are using any APIs from any products, be sure to explicitly load them via HTTPS. HTTP is dead. Long live HTTP! HTTPS is the new normal for all websites, all around the world, so in the coming months, we will completely disable HTTP (i.e., loading pages via HTTPS will be forced automatically) and make other important security upgrades for all products (such as enabling HSTS and other security related headers). Here at Springy HQ we are working (and will continue to work) tirelessly to ensure the security and privacy of all of our users and their patrons in their online activities. Still on LibAnswers v1 or LibAnalytics? The best advice we can give you is to move to LibAnswers v2 or LibInsight / LibInsight Lite (respectively) in order to ensure that your systems are taking advantage of the latest options for security, including ensuring loading of sites over HTTPS. We do not support security certificates for v1 products. Please contact our support team to discuss changing your domain to one on libguides.com so you can use our security certificate. We are not supporting certs for those other domains.